Food ingredients manufacturer Macphie is encouraging healthy eating habits with a donation of gardening equipment to a Mearns school. The Glenbervie-based business is giving six sets of spades, forks, trowels and watering cans to help the children at Johnshaven Primary learn how to grow their own vegetables. The company’s chairman Alastair Macphie said: “It’s important for young people to develop a good understanding of where their food comes from. “The gardening equipment helps bring lessons to life and encourages healthy eating habits from a young age. Macphie has a long history of supporting its communities, donating one percent of its profits to local causes every year. 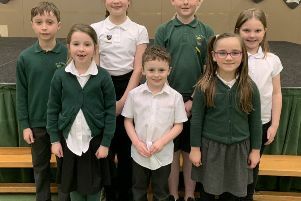 Johnshaven Primary School, which has 34 pupils, approached the company last year to request funding for the tools at a cost of around £400 and is delighted with the donation. Head teacher Karen Johnstone said: “We are very grateful for Macphie’s support and look forward to getting out into the garden in the coming months. P6 pupil Kira Grant said: “I think it’s very kind of Macphie to have given us new tools. Macphie is the UK’s leading independent food ingredients manufacturer and has been trading for 90 years. The company employs more than 300 workers across three sites - its headquarters in Glenbervie, at Tannochside in North Lanarkshire, and at the Midlands Centre of Excellence, near Coventry.